Soon, there may not be many solar manufacturers left on public markets. Don't look now, but the solar industry is slowly exiting from public markets. Trina Solar and JA Solar have gone private, and Canadian Solar's CEO is trying to take his company off public markets. Now, Hanwha Q Cells (NASDAQ:HQCL) is trying to exit the public market with an $825 million buyout offer from its parent company, Hanwha Chemical Corporation, earlier this week. If the deal goes through, it would mean that JinkoSolar (NYSE:JKS) will be the last major Chinese solar manufacturer to be publicly traded in the U.S. The solar experiment hasn't gone well for U.S. investors, and now companies are seeing greener pastures as well. Unlike its peers, Hanwha Q Cells isn't getting a buyout offer from management. Its offer is from Hanwha Chemical Corporation's subsidiary Hanwha Solar Holdings. It's a related company that will fold it into the larger organization. For investors, the upside is an offer of $9.90 per share, which is a big jump from July lows below $6 per share. Despite being one of the biggest solar manufacturers in the world, with 4,300 megawatts (MW) of module capacity, Hanwha Q Cells has struggled financially for years. Over the past year, the company has barely broken even, and its total long-term debt has ballooned to $1.4 billion. 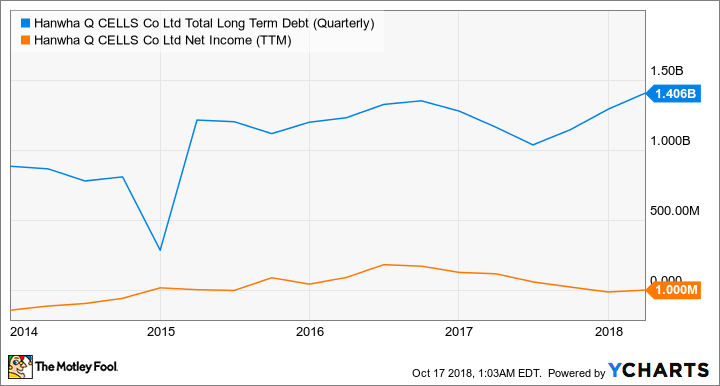 HQCL Total Long Term Debt (Quarterly) data by YCharts. 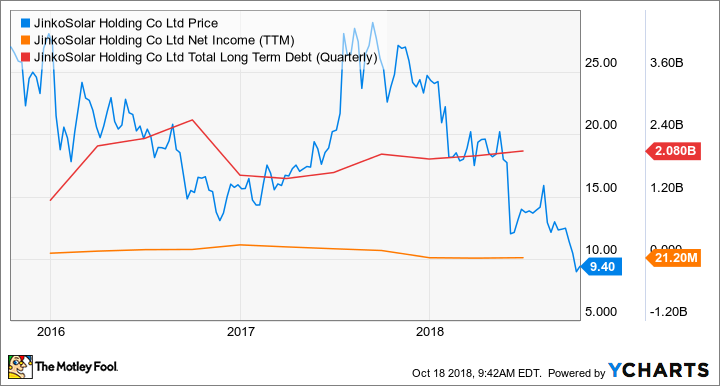 Debt is what has been killing solar companies for years, and given the rapidly dropping price of solar panels in 2018, it's likely losses would begin piling up in the next few quarters. From that perspective, it's probably good for investors that a buyout offer was brought to the table. Hanwha Q Cells and other solar manufacturers may see being private as a way to slowly improve their business and return to profitability. As public companies, there was pressure to grow, which meant taking on debt to build manufacturing capacity. That debt is ultimately what caused the collapse of some of the industry's biggest manufacturers (Suntech Power and Yingli Green Energy). There are also upgrades that need to take place in manufacturing. Mono-PERC technology (an additional cell layer that enhances light absorption) has higher efficiency than commodity cells and is gaining market share. Keeping up would require massive manufacturing upgrades for a company like Hanwha Q Cells. Folding into a larger organization could also allow Hanwha Q Cells to take a longer-term view of operations without the financing pressure of being independent. There are a lot of reasons a highly leveraged, commodity solar manufacturer might not want public scrutiny right now. This may be the last hurrah for public solar companies in the U.S. JinkoSolar is the last major Chinese manufacturer to remain public, but it's facing high debt and low profitability, just like the other companies that have been taken private. Chinese solar manufacturers may dominate the global solar industry, but they've been a flop as investments in the U.S. It looks like one by one they're being taken off the market, leaving fewer options for solar investors. Maybe that's for the best.